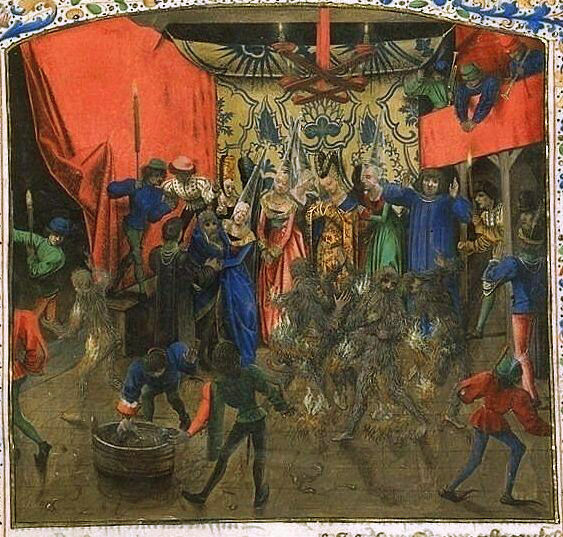 The Bal des Ardents (Ball of the Burning Men) or Bal des Sauvages was a masquerade ball held on this date in 1393 in Paris at which Charles VI of France performed in a dance with five members of the French nobility. Four of the dancers were killed in a fire caused when a torch brought in by Charles’s brother, Louis, Duke of Orléans, caught the highly flammable costumes on fire. 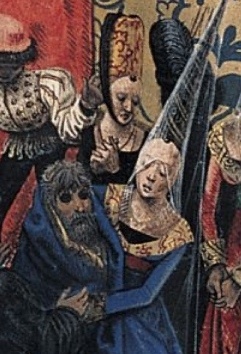 Charles and another of the dancers, the noble knight Ogier de Nantouillet survived. The event undermined confidence in Charles’s capacity to rule. Parisians considered it proof of courtly decadence and threatened to rebel against the more powerful members of the nobility. In 1380, after the death of his father, Charles V of France, the 12-year-old Charles VI was crowned king, beginning his minority with his four uncles acting as regents. Two years later, one of them, Philip of Burgundy, described by historian Robert Knecht as “one of the most powerful princes in Europe,” became sole regent to the young king after Louis of Anjou pillaged the royal treasury and departed to campaign in Italy. Charles’s other two uncles, John of Berry and Louis of Bourbon, showed little interest in governing. 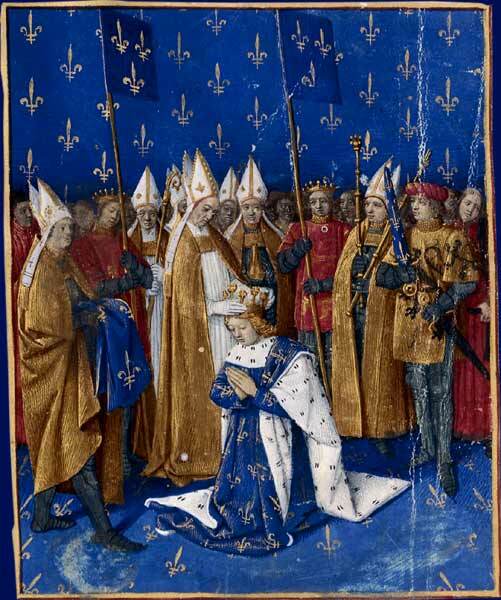 In 1387, the 20-year-old Charles assumed sole control of the monarchy and immediately dismissed his uncles and reinstated the Marmousets, his father’s traditional counselors. Unlike his uncles, the Marmousets wanted peace with England, less taxation, and a strong, responsible central government—policies that resulted in a negotiated three-year truce with England, and the Duke of Berry being stripped of his post as governor of Languedoc because of his excessive taxation. 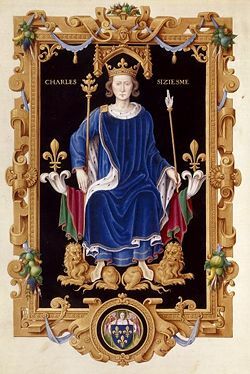 In 1392 Charles suffered the first in a lifelong series of attacks of mental illness, manifested by an “insatiable fury” at the attempted assassination of the Constable of France and leader of the Marmousets, Olivier de Clisson—carried out by Pierre de Craon but orchestrated by John V, Duke of Brittany. Convinced that the attempt on Clisson’s life was also an act of violence against himself and the monarchy, Charles quickly planned a retaliatory invasion of Brittany with the approval of the Marmousets, and within months departed Paris with a force of knights. 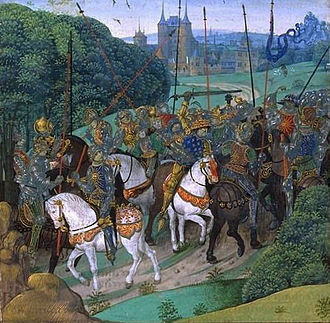 On a hot August day outside Le Mans, accompanying his forces on the way to Brittany, without warning Charles drew his weapons and charged his own household knights including his brother Louis I, Duke of Orléans—with whom he had a close relationship—crying “Forward against the traitors! They wish to deliver me to the enemy!” He killed four men before his chamberlain grabbed him by the waist and subdued him, after which he fell into a coma that lasted for four days. Few believed he would recover. his uncles, the dukes of Burgundy and Berry, took advantage of the king’s illness and quickly seized power, re-established themselves as regents, and dissolved the Marmouset council. The comatose king was returned to Le Mans, where Guillaume de Harsigny—a venerated and well-educated 92-year-old physician—was summoned to treat him. After Charles regained consciousness, and his fever subsided, he was returned to Paris by Harsigny, moving slowly from castle to castle, with periods of rest in between. Late in September Charles was well enough to make a pilgrimage of thanks to Notre Dame de Liesse near Laon after which he returned again to Paris. The king’s sudden onset of insanity was seen by some as a sign of divine anger and punishment and by others as the result of sorcery. Modern historians speculate that Charles may have been experiencing the onset of paranoid schizophrenia. Charles continued to be mentally fragile, believing he was made of glass, and according to historian Desmond Seward, running “howling like a wolf down the corridors of the royal palaces.” Contemporary chronicler Jean Froissart wrote that the king’s illness was so severe that he was “far out of the way; no medicine could help him.” During the worst of his illness Charles was unable to recognize his wife, Isabeau of Bavaria, demanding her removal when she entered his chamber, but after his recovery Charles made arrangements for her to hold guardianship of their children. Queen Isabeau eventually became guardian to her son—the future Charles VII of France— (b. 1403), granting her great political power and ensuring a place on the council of regents in event of a relapse. In A Distant Mirror: The Calamitous 14th Century the historian Barbara Tuchman writes that the physician Harsigny, refusing “all pleas and offers of riches to remain,” left Paris and ordered the courtiers to shield the king from the duties of government and leadership. He told the king’s advisors to “be careful not to worry or irritate him …. Burden him with work as little as you can; pleasure and forgetfulness will be better for him than anything else.” To surround Charles with a festive atmosphere and to protect him from the rigors of governing, the court turned to elaborate amusements and extravagant fashions. Isabeau and her sister-in-law Valentina Visconti, Duchess of Orléans, wore jewel-laden dresses and elaborate braided hairstyles coiled into tall shells and covered with wide double hennins that reportedly required doorways to be widened to accommodate them. 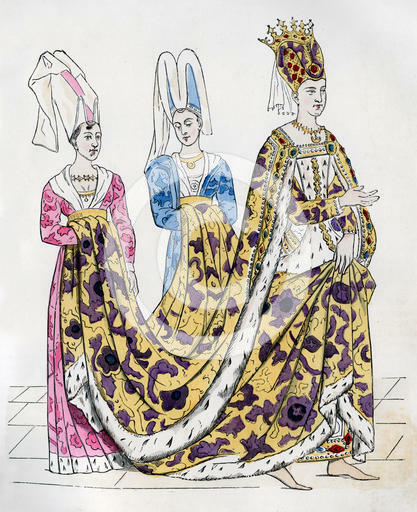 On 28 January 1393, Isabeau held a masquerade at the Hôtel Saint-Pol to celebrate the third marriage of her lady-in-waiting, Catherine de Fastaverin. Tuchman explains that a widow’s remarriage was traditionally an occasion for mockery and tomfoolery, often celebrated with masquerades or charivari characterized by “all sorts of licence, disguises, disorders, and loud blaring of discordant music and clanging of cymbals.” On the suggestion of Huguet de Guisay, whom Tuchman describes as well known for his “outrageous schemes” and cruelty, six high-ranking knights performed a dance in costume as wood savages. 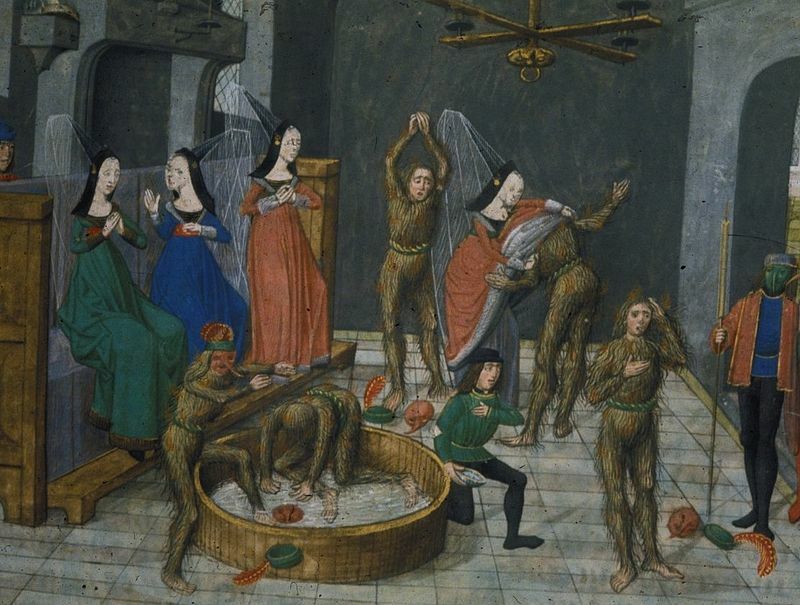 The costumes, which were sewn on to the men, were made of linen soaked with resin to which flax was attached “so that they appeared shaggy and hairy from head to foot.” Masks made of the same materials covered the dancers’ faces and hid their identities from the audience. Some chronicles report that the dancers were bound together by chains. Most of the audience were unaware that Charles was among the dancers. Strict orders forbade the lighting of hall torches and prohibited anyone from entering the hall with a torch during the performance, to minimize the risk of the highly flammable costumes catching fire. According to historian Jan Veenstra the men capered and howled “like wolves”, spat obscenities and invited the audience to guess their identities while dancing in a “diabolical” frenzy. Charles’s brother, Orléans, arrived with Phillipe de Bar, late and drunk, and they entered the hall carrying lit torches. 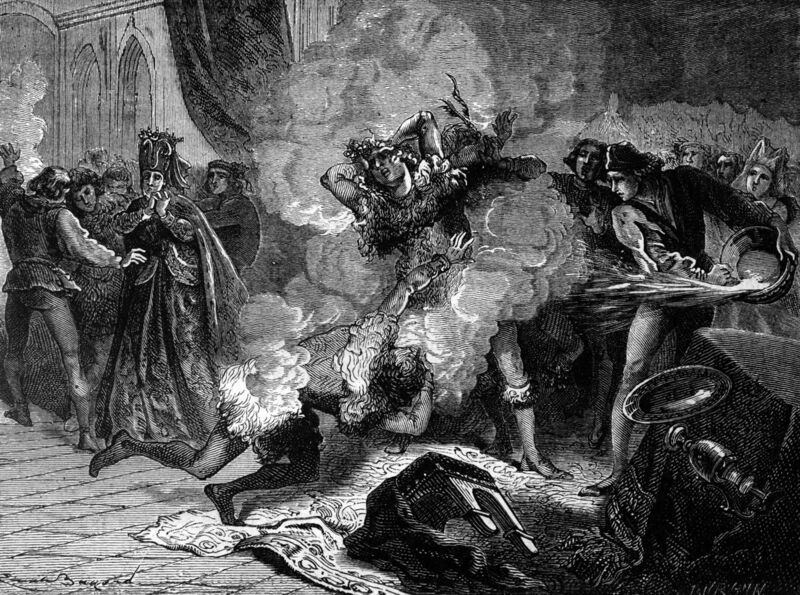 Accounts vary, but Orléans may have held his torch above a dancer’s mask to reveal his identity when a spark fell, setting fire to the dancer’s leg. In the 17th century, William Prynne wrote of the incident that “the Duke of Orleance … put one of the Torches his servants held so neere the flax, that he set one of the Coates on fire, and so each of them set fire on to the other, and so they were all in a bright flame,” whereas a contemporary chronicle stated that he threw the torch at one of the dancers. The citizens of Paris, angered by the event and at the danger posed to their monarch, blamed Charles’s advisors. A “great commotion” swept through the city as the populace threatened to depose Charles’s uncles and kill dissolute and depraved courtiers. Greatly concerned at the popular outcry and worried about a repeat of the Maillotin revolt of the previous decade—when Parisians armed with mallets turned against tax collectors—Charles’s uncles persuaded the court to do penance at Notre Dame Cathedral, preceded by an apologetic royal progress through the city in which the king rode on horseback with his uncles walking in humility. Orléans, who was blamed for the tragedy, donated funds in atonement for a chapel to be built at the Celestine monastery. Froissart’s chronicle of the event places blame directly on Charles’ brother, Orléans. He wrote: “And thus the feast and marriage celebrations ended with such great sorrow … [Charles] and [Isabeau] could do nothing to remedy it. We must accept that it was no fault of theirs but of the duke of Orléans.” Orléans’ reputation was severely damaged by the event, compounded by an episode a few years earlier in which he was accused of sorcery after hiring an apostate monk to imbue a ring, dagger and sword with demonic magic. 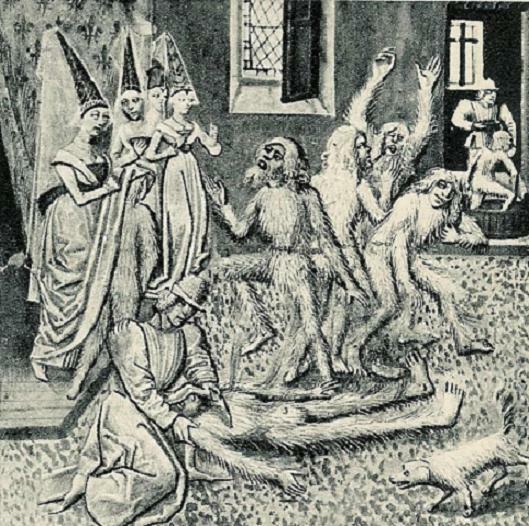 The theologian Jean Petit would later testify that Orléans practiced sorcery, and that the fire at the dance represented a failed attempt at regicide made in retaliation for Charles’ attack the previous summer. The Bal des Ardents added to the impression of a court steeped in extravagance, with a king in delicate health and unable to rule. Charles’ attacks of illness increased in frequency such that by the end of the 1390s his role was merely ceremonial. By the early 15th century he was neglected and often forgotten, a lack of leadership that contributed to the decline and fragmentation of the Valois dynasty. In 1407, Philip the Bold’s son, John the Fearless, had Orléans assassinated because of “vice, corruption, sorcery, and a long list of public and private villainies”; at the same time Isabeau was accused of having been the mistress of her husband’s brother. Orléans’ assassination pushed the country into a civil war between the Burgundians and the Orléanists (known as the Armagnacs), which lasted for several decades. The vacuum created by the lack of central power and the general irresponsibility of the French court resulted in it gaining a reputation for lax morals and decadence that endured for more than 200 years. I have chosen a recipe for waffles (gaufres) from Le Ménagier de Paris, a 14th century French manuscript. Waffles were very popular in the Middle Ages in France. They were made using waffle irons in much the same way as they are made today. Gauffres sont faites par quatre manières L’une que l’en bat des œufs en une jatte, et puis du sel et du vin, et gette-l’en de la fleur, et destremper l’un avec l’autre, et puis mettre en deux fers petit à petit, à chascune fois autant de paste comme une lesche de frommage est grande, et estraindre entre deux fers et cuire d’une part et d’autre; et se le fer ne se délivre bien de la paste, l’en l’oint avant d’un petit drappelet mouillé eu huille ou en sain. La deuxième manière est comme la première, mais l’en y met du frommage, c’est assavoir que l’en estend la paste comme pour faire tartre ou pasté, puis met-l’en le frommage par 1’esches ou milieu et recueuvre-l’en les deux bors; ainsi demeure le frommage entre deux pastes et ainsi est mis entre deux fers. La tierce manière, si est de gauffres couléisses, et sont dictes couléisses pour ce seulement que la paste est plus clère et est comme boulie clère, faicte comme dessus; et gecte-l’en avec, du fin frommage esmié à la gratuise; et tout mesler ensemble. Waffles are made in four ways. First way, beat eggs in a bowl, then add salt and wine;sprinkle with flour and mix together.Then gradually fill two [waffle] irons with this mixture, no more than the equivalent of a cheese strip at a time, then tighten the two irons, and cook on both sides.If the dough does not come off easily from the iron, rub it first with a piece of cloth that has been soaked in oil or fat. The second way is like the first, but add cheese, that is, spread the batter as though making a tart or pie, then put slices of cheese in the middle, and cover the edges. Thus the cheese stays within the batter and then you put it between two irons. 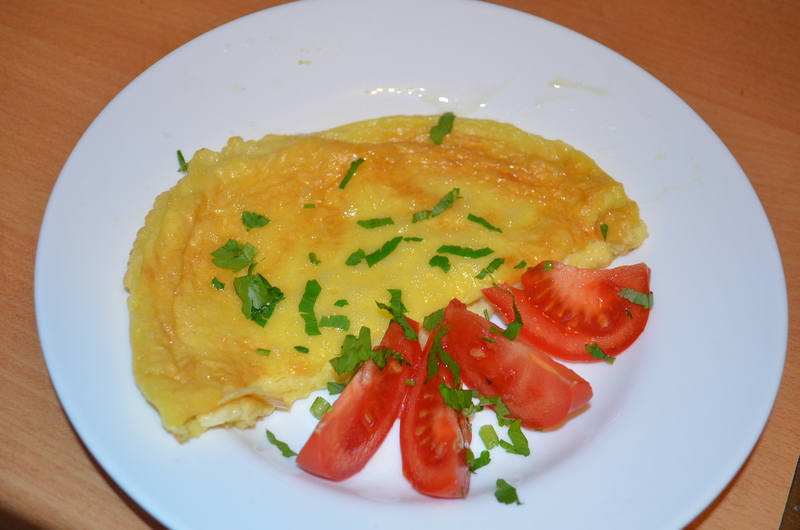 The third way gives dropped waffles, so called simply because the dough is more fluid;it is made ​​as above but with the consistency of a clear broth.Mix in the grated cheese. The fourth way is to knead the flour with water, salt and wine, no eggs or cheese. 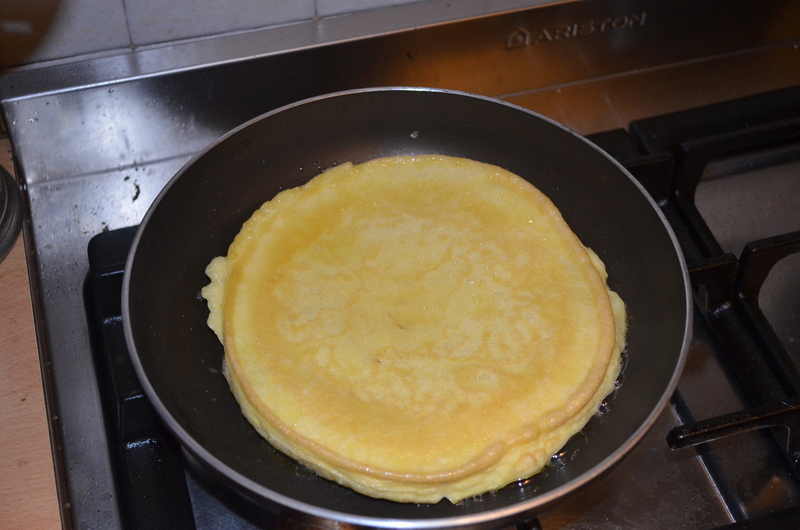 Well, I don’t have a waffle iron, so I made this recipe using the second method, with a skillet, much like a pancake. Heat oil in a skillet over medium heat, and pour in your batter. Cook until the top is no longer moist. 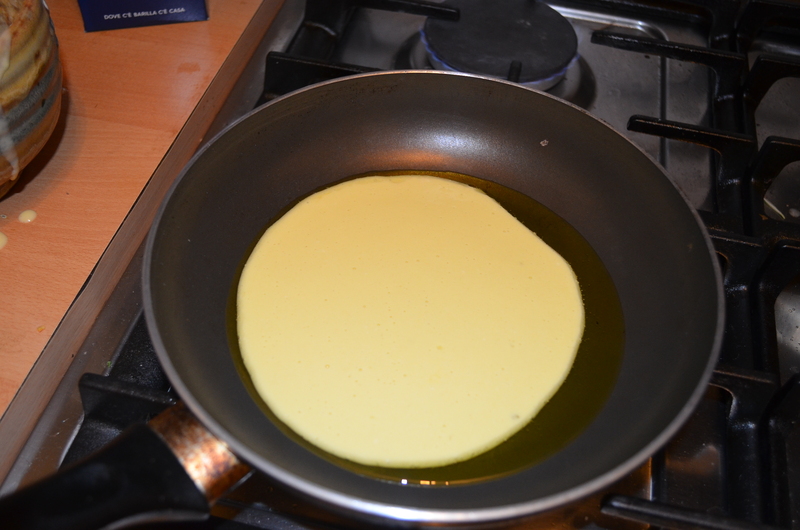 Then cover with another layer of batter. Cook the top under the broiler. 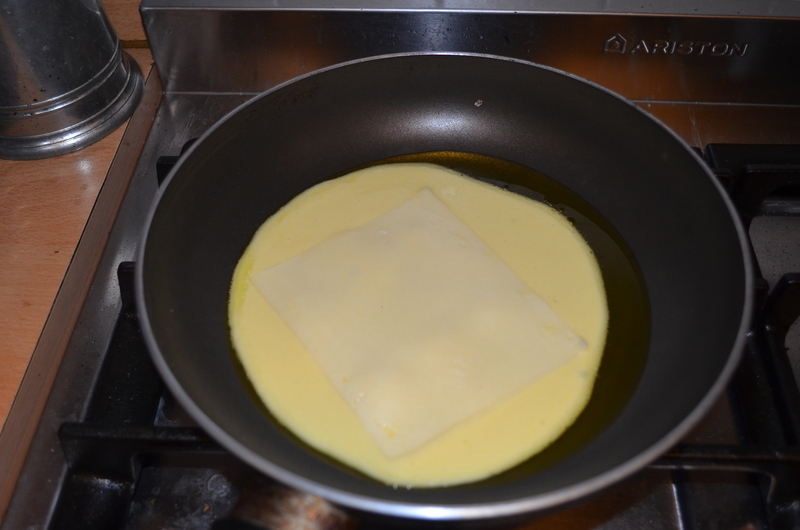 You can see that the finished product has two layers with melted cheese in the middle. Made a nice breakfast as I was writing. Bon appétit.